This piece is part of the Royal College of Art Visiting Artists Collection. 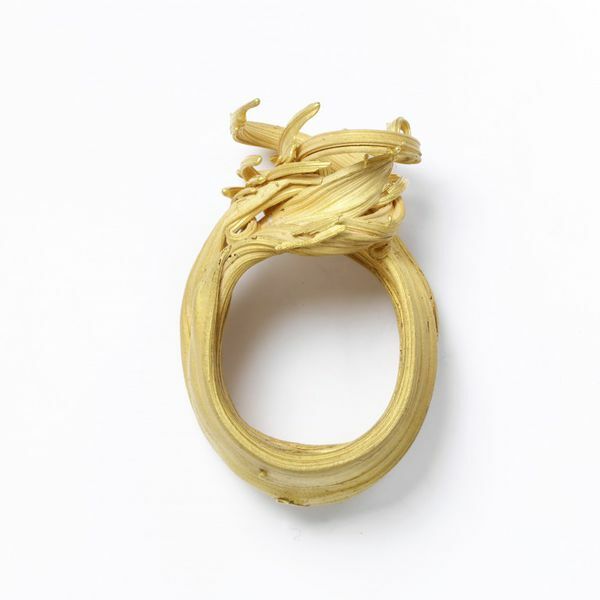 Every year from 1987 to 2006, while David Watkins was Professor of Goldsmithing, Silversmithing, Metalwork and Jewellery at the RCA, he invited four jewellers and silversmiths from outside Britain to give a week-long masterclass. The artists brought diverse skills, aesthetics and approaches. The first call on their time was to interact closely with the students. In addition, although concentrating on their teaching and working in an unfamiliar studio, each artist generously made an object for the RCA's collection. The Royal College of Art Visiting Artists Collection, now transferred to the V&A, is a major document of international contemporary jewellery, a tribute both to the artists and to the vibrancy of the RCA as a teaching institution. Karl Fritsch (born 1963) trained at the Goldschmiedeschule in Pforzheim and the Akademie der Bildenden Künste in Munich. He has reached beyond his rigorous technical training to a much freer and more child-like effect. He once stated 'I would like some day to handle gold the way one handles plasticine', an ambition he realizes with this ring. He has explained that 'the pieces are initially formed from wax. The organic malleability and plasticity of the material gradually seduced me into working in a more spontaneous manner. The shapes have become larger and less inhibited ...Initially the pieces have a "not" designed quality, clumsy, sluggish and thick. But the metal appears mystical, as if the nature of the material has created this indefinite shape itself'. An irregular band of swirling strands of unpolished gold wrap around the finger, the ends meeting in a whirl to form the bezel. The ring is cast from a wax model, and a remnant casting sprue is used as a feature with an adjoining gold globule.